Welcome to week 6: 5 Authors I’d Like to meet (dead or alive). Mark Twain – I was greatly inspired by Mark Twain when I was younger, and after visiting Hannibal, Missouri I was even more motivated. For a man who wrote sagacious wit, he lived a tragic life. It makes me realize how much we often take for granted and motivates me to do better. I would love to sit down over a cup of coffee or tea with him and ask a million questions and let him regale me with his sardonic humor. J.R.R. Tolkien – To get inside his head! Oh my, can you just imagine?? Where did he get the ideas for . . . (fill in the blank) What inspired specific characters? Did he write linear? Did he write chronologically? Who did he feel influenced him? Anne McCaffrey – The queen of all things dragon! Oh to discuss her dragon world would be amazing! Katie McAlister – I would LOVE to sit down over lunch and talk shop with this amazing woman. I adore her sense of humor, her writing style and OK, it would probably have to be a full day’s worth because I would fangirl her so hard for the first several hours. SQUEAL!!!! Seriously though, I would love to meet her in person. On a similar note, last year at Penned Con I got the chance to meet Angie Fox! I’ve adored her for years. When I found out she was a local St. Louisan, I hoped that some day I could meet her and I DID!!! By the way, she’s just as amazing in person. I hope I didn’t emberass her by fangirling her. I tried to act cool, but you know how it is, right? I don’t think I could have been any less cool if I had met Jensen Ackles in person. GAH!!! In my quest for finding recipes that I can eat and don’t taste like cardboard, or consist of a bowl of kale. . . I’ve come across a few winners. So, I decided to share a few of those with you here. My dietary constraints are cancer and diabetes. Sugar-free is an absolute necessity, and with diabetes, low carb count is essential as well. I have been cooking with whole grains, fresh foods, mostly lean proteins – fish and poultry, and very few processed foods of any sort. I feel great most of the time. I feel so much healthier than I was at this time last year. Small changes add up to big results. Here’s a tasty recipe if you want to make just one healthy switch in your diet. Preheat oven to 400.F Grease 12 muffin cups. set aside. In a medium bowl stir together flour, brown sugar, baking powder, cinnamon, and salt. Make a well in the center of flour mixture, set aside. IN another bowl, combine banana, milk, butter, egg, and vanilla. Add banana mixture all at once to flour mixture. Stir just until moistened. Batter will be lumpy. Fold in blueberries. Spoon batter into prepared muffin cups. filling each about three-fourths full. Bake for 15 to 20 minutes or until golden brown on top. Cool on wire rack, just five minutes then serve warm. Nutritional info per muffin: 172 calories, 4 g total fat, (3 g saturated with real butter) 11 mg cholesterol, 135 mg sodium, 25 grams of carbs, 3 g protein. I gotta be honest, I used a few more blueberries than the recommended amount. What can I say, I like blueberries! It’s good to have nutritious tasty foods! Hope you enjoy. Let me know if you try the recipe and what you think! Write on my friends, write on! Happy Friday! 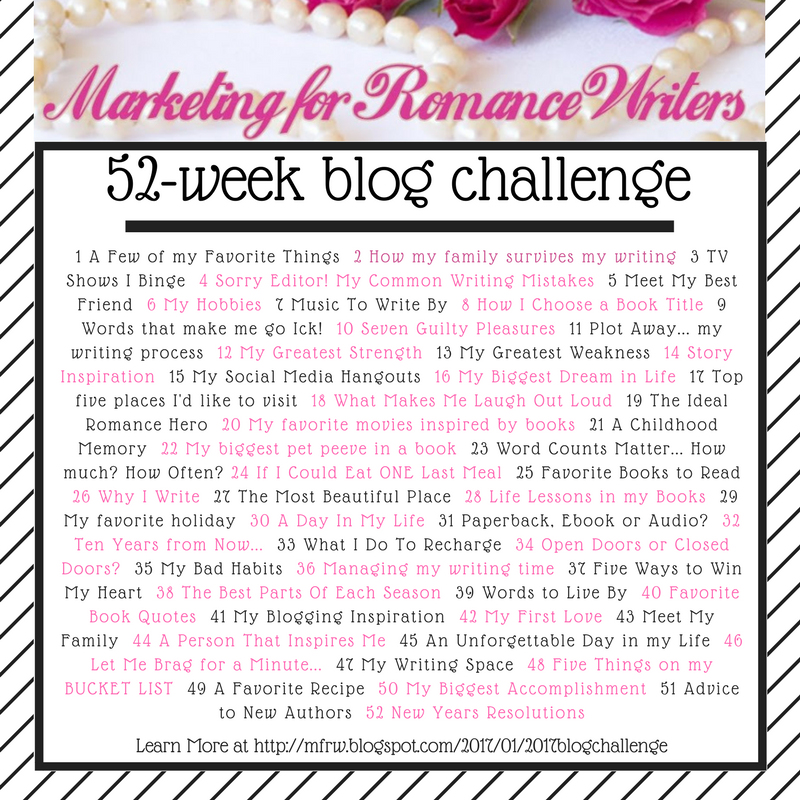 It’s time for the MFRW 52 week blog hop for 2018!! YAY! This week’s prompt: A Book That Has Influenced My Life. Which one to choose? That’s the thing about readers, we sometimes read excellent books that impact us! Maybe I should make mine in list form. The Bible – I was raised in a denominational church that my Grandfather founded, that had my dead relatives names on the stained glass window. I never read the Bible then, it was my parent’s religion. However, when I was in college, I was greatly influenced by an important person in my life that told me I should read it for myself. You want violence? Romance? Betrayal? Heartbreak? Disease? Pestilence? War? Love???? It’s all there. Seriously, go read Song of Solomon sometime – hubba hubba! I read it from Genesis to Revelations. I read it like a history of mankind book. I cried, I laughed, I connected. It guides my daily path. I made the decision for Christ just a couple weeks after New Year in 1985 and have never looked back. The Four Agreements – I’m not forsaking my faith here, so don’t even go there. I have issues with a lot of things within the Christian community, namely that many are judgmental, discriminating and have lost their love for humanity. They are all about the religious practices, us four and no more, the bless me club. It’s the very reason why Mother Theresa’s selfless sacrifice was such a tremendous act. These are things that I personally have grievances with. Because, at the end of the day, we need to be kind to each other and love one another. We are instructed as Christians to Love GOd with our whole heart, our whole soul, and our whole mind and to Love our neighbor as ourselves. Many people forget that last part and it is grievous. So anyway, I absolutely agree with the four agreements. No pun intended. I have a page in my journal that is the four agreements to remind myself often. I feel they help me be at peace with myself and keep the compassion towards others. The Adventures of Tom Sawyer – Literally changed my view on reading from the forced reading required at school to reading for pleasure! The Hobbit, Lord of the Rings trilogy, The Silmarillion – the epitome of reading pleasure. Outlander Series – OMG! Have you ever seen these books? They are huge – like War and Peace huge. I read the first one in like 2 days, then raced back to the library and checked out the rest of the series. This book or series of books, jerked me out of a pity party slump where I was feeling useless as a writer, had had a long string of rejections on books and the only thing selling was magazine articles. The Worst Romance Book I ever read – This may sound strange, but yes it really did change things for me. I have the book. It’s written by a well-known author, whom I’ve met in person and is a lovely person. Makeover on the front stoop in the ten minutes she waited. She started off with long blonde hair, crystalline blue eyes, khaki trousers, and a red polo as described in the previous two chapters. Then when the man answered the door, she wore snug straight leg jeans, a soft angora sweater, her Ginger swing bob made a perfect arch as she turned to face him with her green eyes. WHAT? This book launched me on my writing endeavors. If this crap could get published, surely I could get published! I finished the book, but it took me a very long time. So once again I didn’t exactly follow the rules. They are more like guidelines anyway, right?